Thymus vulgaris is an herb long used in alternative medicine. More commonly known as thyme, it's thought to contain compounds with antioxidant and antibacterial effects. It's available in dietary supplement form and is used in alternative medicine to address a wide range of health problems. One of the constituents of Thymus vulgaris is thymol, a compound shown to possess anti-inflammatory, antioxidant and antimicrobial properties. An antimicrobial is a substance that destroys or suppresses the growth of microorganisms, including bacteria and fungi. Due to limited research on the use of Thymus vulgaris, it's too soon to recommend it as a treatment for any condition. It's important to note that self-treating a condition and avoiding or delaying standard care may have serious consequences. If you're considering using it for any health purpose, make sure to consult your physician first. Thymus vulgaris is also purported to stimulate the immune system, improve liver health and reduce pain. When essential oil of Thymus vulgaris is applied to the scalp, it is said to promote hair growth and aid in the treatment of alopecia areata. It is also thought to prevent cavities. Thymus vulgaris is also sometimes used in commercial mouthwashes to fight bad breath. Preliminary research suggests that Thymus vulgaris may offer a number of health benefits. For instance, animal-based studies published over the past decade indicate that Thymus vulgaris may act as a pain-reliever, protect the brain from aging-related damage and shield both the brain and liver from the harmful effects of alcohol abuse. In recent tests on human cells, scientists have determined that Thymus vulgaris may also curb inflammation and boost immune function. Additionally, a study published in a 2005 issue of the Journal of the American Mosquito Control Association found that compounds extracted from the essential oil of Thymus vulgaris may act as a mosquito repellent. 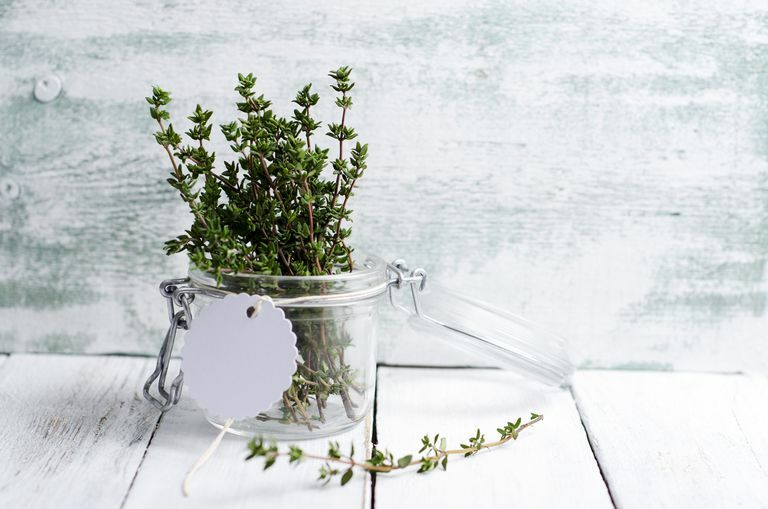 While few studies have tested the health effects of Thymus vulgaris in humans, there's some evidence that the herb may help alleviate menstrual pain. In a study published in the Journal of Research in Medical Sciences in 2012, researchers assigned 120 female college students with menstrual cramps to treatment with either Thymus vulgaris supplements or ibuprofen. Results revealed that both treatments were similarly beneficial in relieving pain. Since so few studies have tested the effects of Thymus vulgaris supplementation, the safety of long-term or regular use of this herb is unknown. Thymus vulgaris has been found to cause several side effects, including stomach upset. There's also some concern that Thymus vulgaris may inhibit blood clotting. Therefore it's crucial to avoid the use of Thymus vulgaris at least two weeks prior to undergoing surgery. Keep in mind that supplements haven't been tested for safety, and dietary supplements are largely unregulated. In some cases, the product may deliver doses that differ from the specified amount for each herb. In other cases, the product may be contaminated with other substances such as metals. Also, the safety of the use of supplements in pregnant women, nursing mothers, children and those with medical conditions or who are taking medications has not yet been established. Several other herbs may help enhance immune system function and shield you from illness. For example, taking herbs like andrographis, astragalus, echinacea, and elderberry at the first sign of a cold may help treat symptoms and shorten the cold's duration. Amirghofran Z, Ahmadi H, Karimi MH. "Immunomodulatory activity of the water extract of Thymus vulgaris, Thymus daenensis, and Zataria multiflora on dendritic cells and T cells responses." J Immunoassay Immunochem. 2012;33(4):388-402. Fachini-Queiroz FC, Kummer R, Estevão-Silva CF, Carvalho MD, Cunha JM, Grespan R, Bersani-Amado CA, Cuman RK. "Effects of Thymol and Carvacrol, Constituents of Thymus vulgaris L. Essential Oil, on the Inflammatory Response." Evid Based Complement Alternat Med. 2012;2012:657026. Park BS, Choi WS, Kim JH, Kim KH, Lee SE. "Monoterpenes from thyme (Thymus vulgaris) as potential mosquito repellents." J Am Mosq Control Assoc. 2005 Mar;21(1):80-3. Shati AA, Elsaid FG. "Effects of water extracts of thyme (Thymus vulgaris) and ginger (Zingiber officinale Roscoe) on alcohol abuse." Food Chem Toxicol. 2009 Aug;47(8):1945-9. Taherian AA, Babaei M, Vafaei AA, Jarrahi M, Jadidi M, Sadeghi H. "Antinociceptive effects of hydroalcoholic extract of Thymus vulgaris." Pak J Pharm Sci. 2009 Jan;22(1):83-9. Youdim KA, Deans SG. "Effect of thyme oil and thymol dietary supplementation on the antioxidant status and fatty acid composition of the ageing rat brain." Br J Nutr. 2000 Jan;83(1):87-93.